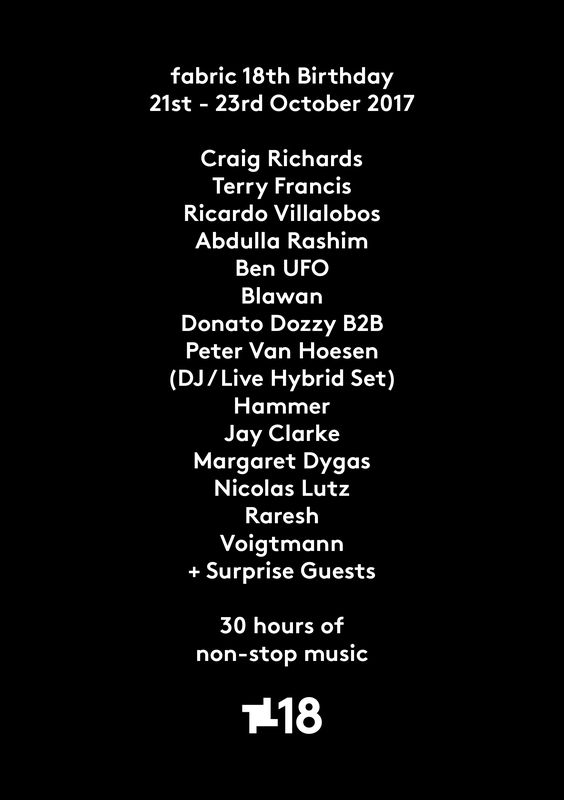 fabric has locked in Ben UFO, Donato Dozzy B2B Peter Van Hoesen, Blawan, Ricardo Villalobos, Abdulla Rashim, Hammer, Jay Clarke, Margaret Dygas, Nicolas Lutz, Raresh, and Voigtmann for its 18th Birthday. Naturally, legendary residents Craig Richards and Terry Francis will also be getting a slice of the cake, with the promise of more surprise guests to boot. The marathon will run for 30 continuous hours, with doors opening on Saturday 21st October, and action finishing up on Monday morning. A re-entry policy will be in place for the duration, for those who need some rest in and amongst, although with a lineup like this chances are leaving will be the biggest challenge of all. 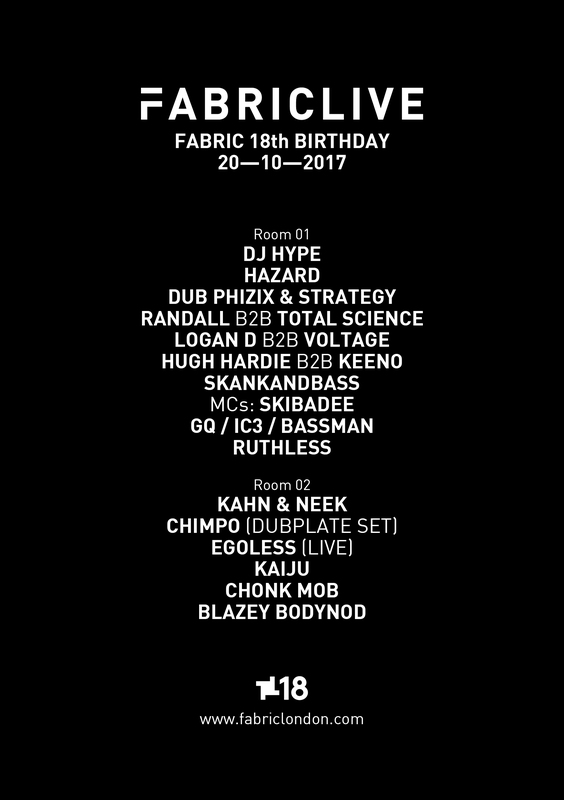 FABRICLIVE will kick start what's set to be one massive weekend, on Friday 20th October, offering something for the broken beat and bass heads. DJ Hype, Hazard, Dub Phizix & Strategy, Randall B2B Total Science, Logan D B2B Voltage, Hugh Hardie B2B Keeno, Skankandbass, Kahn & Neek, Chimpo (playing a dubplate set), Egoless live, Kaiju, Chonk Mob, and Blazy Bodynod are all confirmed. 12 months ago fabric had been forced into closure by authorities, re-opening in January this year after a lengthy battle to overturn the decision which received support from across the electronic world, including ourselves. The club's #saveourculture campaign, used to raise funds at the time, was left with £100,000 after the victory, which it pledged to aid other dance industry causes. Considering that comeback, we're expecting nothing short of an electric atmosphere for this anniversary.